Whilst these are not original ideas, (is anything? ), the following are original creations, either based on 3D models or drawn, edited and assembled into brushes purely within RealDrawPro. The "Paint Shop Pro", "Photoimpact", "Photoshop" and "Painter" communities have been using tubes, brushes or nozzles for many years, and this page began the RealDraw collection. Nozzles are simply brushes made up of a series of images that you would generally use to "make up" an image, ie: by painting a series of strokes (clicking and dragging) with each nozzle. You will need to have RealDraw, PhotoBrush or Photoseam installed to be able to use any of these. Some are suitable to create page borders, some for each individual graphic image, (Clipart), some to paint up an image, some work best when combined with other brushes. All of these may be used to paint onto an existing RealDraw Vector. How you use them is up to you. We would recommend that continuous downward brush strokes be used with the majority of the Nozzles, and consideration be given to careful use of the "opacity" slider control. Just place any new .brs file into your RealDraw/Brushes folder, then follow your own normal painting technique. Our brush nozzle collections begin below, with individual brushes in each download. Click on an image to download the nozzle. Some suggestions or examples of usage, are available below. Need Fish for your Coral Scenes? Not all displayed at actual size. 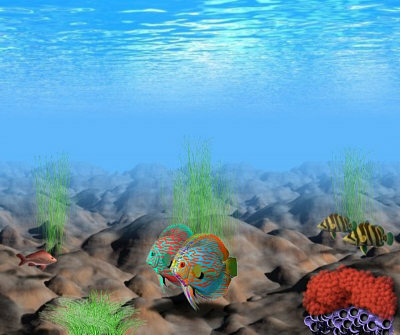 Many of these Fish images are based on 3D models supplied by The Toucan Corporation of Japan and used here with their kind permission. These models can be downloaded from Toucan in .3ds format for your own renderings, or you can purchase High Resolution versions at Turbosquid. Please note that Commercial useage may be restricted with these fish freebies. Not all displayed at actual size. Several of these "Outdoor" nozzles work well with other collections too! Christmas Nozzles are excellent for making up your own decorations, page borders and frames! Craft Collection nozzles are available within BushArts Craft Section. Adjusting the spacing percentage slider will have an effect on how nozzles are applied. Colour overlay may also be suitable for some nozzles. Although painted images will resize down reasonably OK, all image brushes are treated as Bitmaps by RealDraw, not as shapes, therefore upsizing is not recommended; however, the filters included on the "Bitmap Tweak" menu will be available, and you can also still use all of RD's usual other features. All of the image nozzles can also be used to act as a transparency filter. Making your own brushes is very easy to do, read our "Image Brushes" page for some hints. You are able to combine more than one Downloaded Nozzle into a single collection of Brushes by using RealDraws Import/Export function, within the brush panel. The RD Help file has ample information on creating, editing or painting with Brushes. For further information, you should feel free to ask any questions within the Real Draw Forums. Whilst these were created specifically for RealDraw, they will also work with other Mediachance products, such as "PhotoBrush" or "Photoseam".